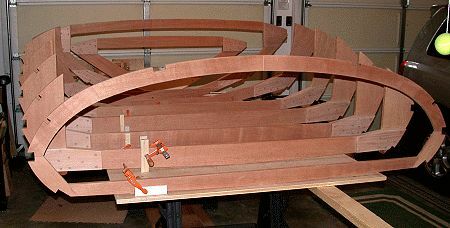 Status: (11/23/04) I have essentially completed the seven frames and the transom, less plywood cover. I was tempted to purchase the frame kit from Glen-L until my wife reminded me that I was undertaking the project because I like to build things and needed a long-term challenge. Glen-L's construction suggestions are invaluable. I used a 4'x8' sheet of 3/4" sand ply plywood as a layout board. I traced four frames on one side and three frames and the transom on the opposite side. 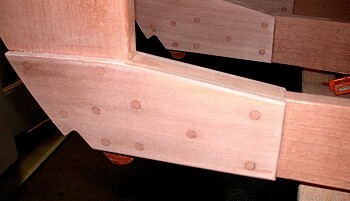 I looking for a clean, all mahogany look on the boat's interior. Therefore, I used 3/8" mahogany marine grade plywood for the gussets and counter sunk and plugged the screws versus using nails. I may be the only one who knows. Phase 2 starts with trying to locate 1" white oak in lengths over 12' long for the motor stringers and keel. I will then order all of the plywood necessary to complete the project as shipping one or two sheets at a time is extremely expensive. Attached are a couple of photos of the frames setting on the layout board.